What does trust look like? Trust is the cornerstone of our teaching. Our students have been ignored for the better part of their lives. When we can show them how much we care and create trust, we can take them anywhere in the realm of Learning, love & Life. 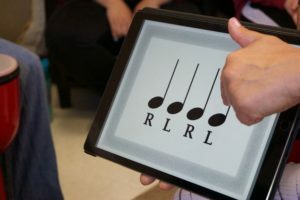 The Rhythmic Arts Project, founded by Eddie Tuduri in 1997 educates all individuals by embracing a methodology that encompasses rhythm as a modality to address basic life and learning skills as well as reading, writing, and arithmetic. 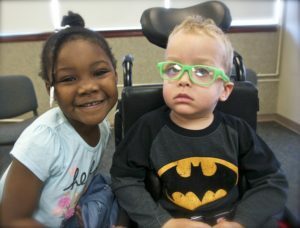 The program is designed for all people of all ages and cultural backgrounds as well as people with Intellectual and Developmental Differences. As a non-profit 501 (c) 3 organization, we honor and celebrate diversity, regardless of religion, race, creed or ethnicity. 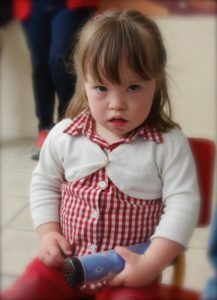 Our approach includes visual, tactile, auditory and perceptual motor matches combined with speech to achieve results. You literally see it, feel it, hear it and speak the lessons. 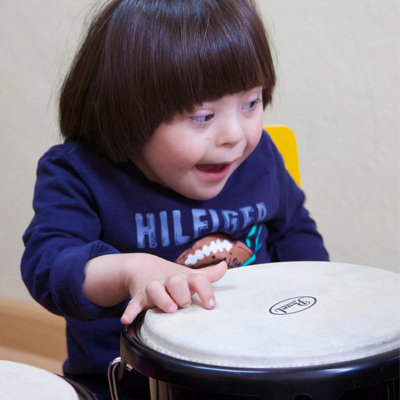 The Rhythmic Arts Project’s primary objective is to promote the inclusion of people with disabilities in all aspects of everyday life. 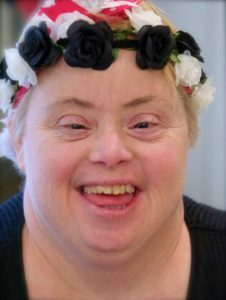 We look forward to a world in which people of all abilities are treated with respect and dignity and are free to fully engage in the world around them. ent years. Since implementing our “Syllabus for Success” which is a pledge by the organization to be accountable from the top down, we have been more successful in determining what organizations and Special Education facilities embrace the TRAP program. Sustainability and follow-through is the aim of this approach and the facilities that have come on board have stayed on board. – Leadership that sees the educational (not recreational) benefit and value of TRAP. We also suggest that conference calls, Skype, some kind of ongoing communication is necessary to maintain and fine-tune the classes. The behavioral process is one of the most significant aspects of The Rhythmic Arts Project. Our main purpose is to have fun and to learn in the process. However, it is important to keep in mind that learning requires high expectations, structure, and reinforcement. We believe that when a person exhibits unacceptable negative behaviors, it is most often an inability to communicate their thoughts or they may very well be in an activity vacuum (where there is nothing of interest going on) and bored. Whether a group of 10 students or individual lessons, these are the things to keep in mind in the course of your teaching. range of motion to strike a drum. In this case, adapted equipment is used if possible or we can play the instrument or voice the responses for them, everybody participates. It is important to remember not to get discouraged if active participation does not occur immediately – Eddie tells a story where it took over 1 year to get a young lady to independently respond to him. The most important thing is to always expect more from your students; Never tell us what they can’t do, concentrate on what they can. There is nothing worse than not being prepared for your class. Your students will know and will take advantage of you, or you will lose the attention and respect of the class. Before arriving for class create a lesson plan. Everyone wants to be recognized and appreciated for his or her individual accomplishments. Sometimes recognition comes positively, but often it may come from a very negative place. How often do you scold when this happens or give negative feedback rather than practice active listening? If the only recognition that a person gets from you are reprimands and anger, they will not respond at all, or ‘act out’ more, just to get attention. The alternative is to find positive actions that result in positive reinforcement. High fives, play the drum in a group, being the leader, and giving high accolades are all examples of positive reinforcement. 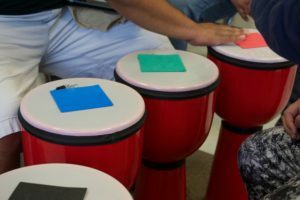 A behavior modification technique can be as simple as temporarily moving a drum away from a disruptive student. This form of non-exclusionary timeout by ignoring the disruption and increasing the accolades, high fives and eye contact with everyone else in the class is often more effective than a verbal reprimand. It is also important to remember to make direct eye contact. Eye contact is a high level of respect. In some severe cases, eye contact may cause the student with Autism to become more uncomfortable so use your discretion in these situations. It is important to let your students know you care about them. Above all, never give up, you will make a connection and learning will surely follow. You will find that their instincts will outshine those of typical children every time so, trust them. Understand that your students need the same guidance and direction as their typically developed peers. (Important) Always give them room (do not hover over them or behind them) and time to think to execute the task on their own before you quite rightly then offer to do it for them. If you feel you are becoming overwhelmed or frustrated due to negative behaviors occurring in your students, take a staff time-out. The timeout can to evaluate a situation and see it from a different perspective. In the event of extreme behavior (aggression towards others, loud, or property destruction, etc.,) remove the student, accompanied by a staff member who can reason and talk with them about the specific problem. When the individual calms down and understands what he/she did wrong, they must further understand that a true apology is in order upon return to the group. Behavioral processes are extremely complicated, yet at the same time simple. “For every action, there is a reaction”. By choosing to react with positive reinforcement, the aforementioned concepts have been proven highly successful in TRAP facilitation.